Carrie Moyer, Down Underneath, 2011, acrylic on canvas, 54 x 72". Bouleversant is an idiomatic French word that denotes with extraordinary precision the sensation you may encounter while visiting Carrie Moyer’s latest solo show. It refers to the feeling of being overwhelmed by or suffering from beauty––the experience of a difficult enjoyment. In “Canonical,” Moyer exhibits paintings that are, simply put, beautiful. But it does not suffice to say that they are just gorgeous paintings; the works also body forth a complex range of emotions. 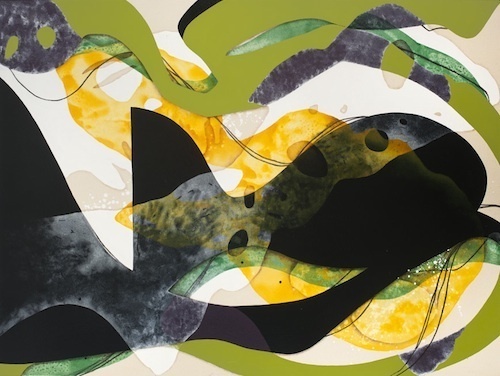 Moyer manipulates acrylic paint, her chosen medium for the past eleven years, to create intricate and gauzy layerings over organic, biomorphic forms and bold lines. In a theatrical Benglisesque display of boldness, she will occasionally throw in some glitter. The diaphanous and lighthearted Frilly Dollop (all works cited 2011) is a multitiered oneiric work in which cadmium yellow hazes and white clouds of diluted acrylics obscure curvilinear, opaque shapes that, in their dynamic battle for prominence, insinuate movement across the expansive canvas. In Down Underneath, Moyer creates a churning, wavelike effect using line, wash, and scale that offers the viewer a phenomenological insight into her painting process by collapsing the distance between object and experience. It is tempting to locate these canvases somewhere between Elizabeth Murray and Helen Frankenthaler, but that would be too reductive, producing a mere murmur amid the loud and expressive matrix of symbols and strokes in Moyer’s new paintings. Her work thrives in the ether beyond. The exquisite beauty she seeks to convey is an elegance that extends a smooth veneer over an encoded emotional dynamism.